Mandy Gray is in a heap of trouble. With a band of murderous outlaws out for her hide, three young children to keep safe, and a castle-turned-prison, there’s not much else she can do but keep her rifle close by and hope for the best. Until Tom Linscott decides to take what’s rightfully his. Or what he deems rightfully his. For five years, he’s admired Mandy Gray from a distance – a greater distance than he’d have liked, and now that her sorry husband’s gone and gotten himself killed, Tom’s on the move. For Mandy. And he’s not takin’ NO for an answer – even if she’s the best sharpshooter on this side of the Mississippi. Problem is – can he win over her affections before she can get a chance kill him? If you’re in the mood for a sweet little romance that will provide only a slight pulse change and perhaps a sigh or two – DON’T READ THIS BOOK!!! 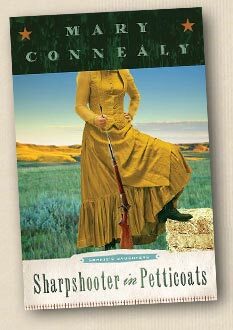 But if you want to laugh at perfectly placed male-female repartee, cringe at life-threatening close calls, up the pulse rate with adventure, and enjoy some sigh-worthy romance… then get to your nearest bookstore as quick as a trigger and BUY Sharpshooter in Petticoats by Mary Connealy. It’s a full cast of characters and an amazing passel of kids, all heaped together in a story that will leave you with a smile on your face and a longing in your heart for just ONE MORE PAGE!! Mary, I’m determined to get on some sort of reading list so someone will just deliver your books to my door on a regular basis. I think I’m keeping Lifeway in business, buying all your books. Thanks for the wonderful adventure. Previous Setting Your Novels to Music? Next What to forget from 2010? Ok so I was visiting a booksite, Amazon I think, and saw a CF book called Ten Plagues by a person named Mary Nealy have you ever heard of this author could it be Mary incognito? LOL just wondering. It’s Mary’s pen name for her suspense stories. Pepper, what a well written and fun review. I’m one of Mary’s Connealy’s many fans and look forward to reading this book. Take the most manly-men of Mary’s books and you have Tom Linscott. He’s so much fun to read, and he’s got this very soft spot for kids and Mandy. I LOVE the way Mary can write those guys. 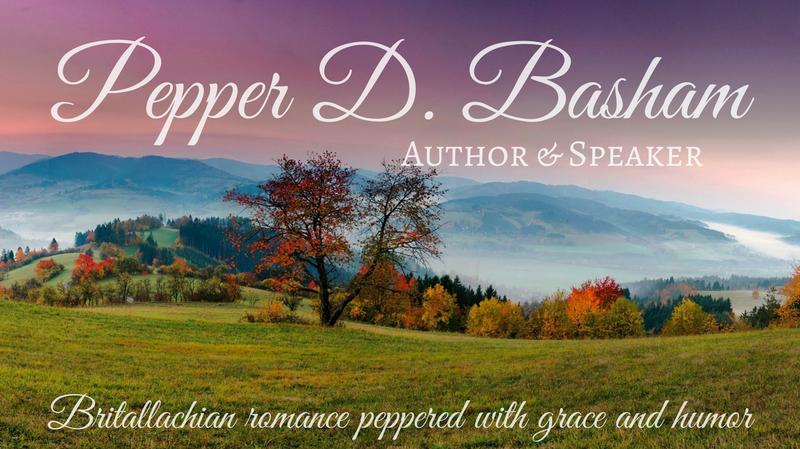 Pepper, A great review!! This book sounds like a lot of fun and great reading. It’s going on my “to read” list! It’s a definite for your reading list. Amazon has Ten Plagues up? I haven’t seen that yet. I picked the pen name mostly to WARN YOU. I had so much fun writing it and I think it’s the most fiercely Christian book I’ve ever written but if you think you’re going to find romantic comedy with cowboys, well, let’s just say YOU HAVE BEEN WARNED. But the romantic comedy with cowboys will continue. I’ve got Deep Trouble (love and death in the belly of the Grand Canyon). Deep Trouble is a sequel to Cowboy Christmas. It releases in May. And Out of Control coming in May. The beginning of a series called The Kincaid Brides. Three ranching brothers trying to tame a wild land. Thanks so much for the review, Pepper. I’m so glad you liked the book. YAY. Woohoo!!! More Connealy classics for my booshelf. But I’m going to read it anway. And it’s always a pleasure to write reviews for you…or any of the Seekers, as a matter of fact. I’m waiting on pins and needles to read SHARPSHOOTER! Thanks for the great review, Pepper! Mary, you have to be one of the most prolific authors on the face of the planet! And most definitely one of the finest! Love ya, girlfriend! I kinda figured that it was going to be a bit more serious than your other books. I’m pretty sure I will love it though since I’ve become a bit of a suspense fan since last year. 🙂 I can’t wait for ALL of those books you mentioned, they sound terrific. Ten Plagues has been up for pre-order since around the 29th I think. AT least that’s when I added it to a few of my book wishlists. 🙂 Hopefully someone has preordered it already!!! Ooooh, I’ve been looking forward to this one! A fun review for a fun book. Great review! I’d like to read it now but I have to wait for it to come out on Kindle. And you are RIGHT about Wrangler! That opening is awesome. You are going to LOVE the opening of Sharpshooter. Well, you’ll love the whole thing. Lots of gunfights and adventure. I can’t wait to catch up on Mary’s books! Great review! I don’t know, though, the opening of “The Husband Tree” was what drew me in from the beginning. If the opening for this one is HALF as good, it’s a keeper! Mary writing suspense? Hooray! I love reading it – too much of a scaredy-cat to write it! LOL But we have to wait until OCTOBER? Mary Connealy…Mary Nealy…She’s on my reading list no matter what her name is. But, suspense is a change for me…so we’ll see how I like it. There’s humor in Ten Plagues, too. And of course romance. But it IS a serial killer story, after all. And I did a lot of research, With a demon possessed serial killer, I didn’t want to treat the subject in a disrespectful or shallow way. I’m sure I took liberties but I tried hard to make it have a Biblical foundation. And honestly, there is a lot of suspense in everything I write. You all know that. (snicker) we have poor Mary worried, gals. I’m sure it’s going to be GREAT, Mare. Doesn’t she catch mice in her spare time? Good grief why didn’t someone tell me Mary was here…how long is she visiting?? Doesn’t the Kincaid series look good, Angi. Oh boy, oh boy – totally excited about a new cowboy series. Pepper suprised me, Teena. I’d have told you, I swear. Good news should be shared very quickly – don’t you think? Pepper, I think you should shorten your tag line. Peppered with humor and grace. A dash of Pepper in everything I do. I’m trying to get you all to talk about something ELSE besides mice and suspense….which are sort of the same thing honestly. Stories of hope and healing, peppered with grace and humor. You know, like little furry critters. Hey, I like suspense. (no surprise), but I even have an outline of a story for one – plus my crazy speculative. I was SOOOOO wickedly tempted to send Mary my bathroom mouse, remember? The one I found in the TOWELS I PICKED UP TO WASH???? But a moment of grace descended and I sent her a PICTURE instead. Because yes, I’m that good a friend. I will say this: Ten Plagues is the manuscript that brought me and Mary together years ago. I e-mailed her to explain why I scored it low in a contest (probably TOO LOW), because it was brilliant. I NEVER THOUGHT CHRISTIAN FICTION WOULD PUBLISH IT. But it’s amazing. In my head, Mary’s best writing is in her suspense, her contemps, her cutting way of taking you on a roller coaster ride through a story jammed with things to trip you up. I’m so proud of Barbour for taking this on. But the fact that she can think of these things… ponder them… dwell on them…. then write them…..
No wonder she can’t sleep! Oh soooo good to see you here. Thanks for the ‘hint’, Ruthy. I’ll read whatever Mary writes, because I know it’s going to be well written and good. Oh yeah! So good to see you here. And thanks for the insight, Ruthy. Can’t wiat to read it all the more now. And Mary, I can totally relate to not sleeping because of ideas floating around. I just got too new ones yesterday and have had them percolating (though I HAVE to finish what I’ve started first…sigh). For example, what type of lady could possibly interest a guy like Sherlock Holmes? Oh Ruthy – and I can’t wait to read your Alleghany series. Your heroes are soooo good 🙂 Plus, I’m a bit partial to Ginger. Pepper, your review has me chomping at the bit to read Mary’s Sharpshooter in Petticoats!!! Does anyone besides me about all these faceless females. Are they afraid they’ll wind up on some Wanted Poster? I’m up to reading the scary side of Mary. During the day. With the lights on. With Christian music playing in the background. With the doors locked. I can’t believe Ruthy finds herself hugging a wild mouse…and TAKES A PICTURE. This is an example of such poor judgment that I consulted with the authoritities to have ‘attendents’ step in. But I allowed her roam free. Hoping she wasn’t a danger to herself and others. We’re on the same brain wave. I TOTALLY know what Mouseketools are. Ten Plagues by Mary Nealy October 1st. I don’t want life to hurry along, because I truly enjoy my kids – but I’m looking forward to the time when there is…time to write. Wow, I missed this too. Great review, Pepper! I think Mary could write a classified ad and make it a best seller! Can’t wait for the Ten Plagues! Being able to handle strong-minded women is a must. Try it, you’ll like it? No, not descriptive. Beef. It’s what’s for barbeque? Don’t want to turn away any non-red meat eaters. I’ll have to think about it, Pepper. Advertising is big business. My classified ad though should make whatever I’m SELLING big business. Ignore this. It’s too early for me to make sense. Isn’t Mary AMAZING??? So many issues. So much fun! Just LOVE her “brand”!! !